Windsor is one of our enduring and well-loved caravan names that for many years was built in Melbourne. The giant West Australian Fleetwood Corporation purchased the company in 2003 to expand its appeal, before moving production in-house to Perth in 2013 as part of Fleetwood’s long-running Coromal brand. At the same time, the Windsor range was treated to a significant makeover and adopted the aluminium frame and Coromal's proven independent suspension. With recent changes to processes and an increase in staff, quality control is on the up, and warranty has strengthened with national roadside assistance and a wider service and dealer network. Windsor caravans are now exclusively pop-top configurations with the Seka aimed at touring couples, the Silhouette as an offroader, and the Rapid, with expanding ends, suitable for families. A variety of layouts and sizes within the three models makes 14 different base versions and an almost endless variety as any Seka can be ordered with a choice of either a high or low roof, single or queen bed and different dinette designs. This different roof height allows you to store the low-line version in a standard height garage, with the bonus of less wind resistance when travelling, whereas the high roof offers more storage in overhead cupboards. Recently in Coffs Harbour, NSW, we hooked a smart looking Seka to the back of Harbour City’s Ford Ranger and made our way through busy traffic to the wide open spaces of the hard packed sand on Boambee Beach. Its 2.1m travel height tucked in neatly behind the twin cab, with black checkerplate sides and wheels a good match for the dark coloured tug. The look is enhanced with orange and black boomerangs and Aboriginal-themed graphics for a splash of colour over the silver walls. 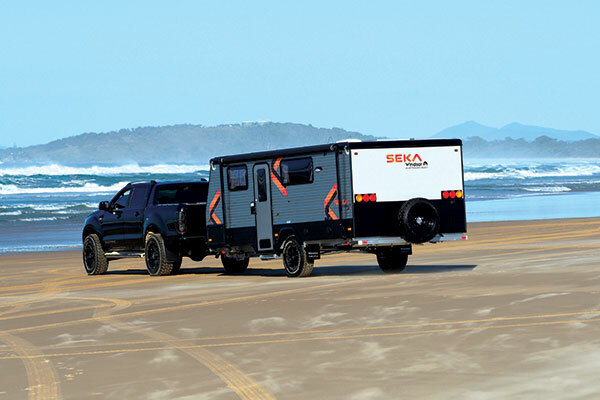 The Seka is firmly supported on a 6in Duragal chassis and A-frame with a 3500kg ball connection. A black checkerplate toolbox tidies up the front end by hiding two 9kg gas bottles and at the same time protects the regulator from stone damage. A gas compliance plate guarantees safe installation and sturdy struts hold the lid high when it's open. The box also has space for hoses, electrical leads and such, which can be securely locked away. I like the way Windsor has lined the tunnel boot up forward with a vinyl floor and carpeted sides. Again, it’s a neat touch that shows a welcome attention to detail. A Carefree awning rolls out for weather protection when sitting outside, and there is a set of external speakers but no power points. A composite aluminum panel covers the rear of the van where a centrally-mounted single spare wheel sits high on a sturdy three-section bar. AL-KO drop-down jacks make things sturdy when camping. The Seka has adopted Coromal’s unique Knee Suspension, which incorporates wishbone arms over leaf springs for an independent setup that delivers smooth, reliable travel. Setting up the van for camping is child’s play, although some may need to bend to move around inside with the top down. Spring-loaded stays at each end, easily lift the roof and lock it into place to make nearly 2m of head height and a good feeling of space. The Highline version gives an extra 110mm of height and would be easier for taller folk to negotiate the lifting process. An advantage of a pop-top is the high zippered windows in the vinyl sides allowing an almost unlimited airflow for hot days. This is tempered, of course, by the reduced insulation properties in winter, but we have found that in extreme conditions the temperature can be maintained by dropping the roof when sleeping. All good, as long as you remember it’s down when you get up in the middle of the night. The cosy layout has the queen-size bed at the front and a full-width ensuite at the rear. In between are a driver-side kitchen and a roomy cafe dinette for two with a large picture window on the kerb side. All the Camec windows throughout have blockouts as well as curtains and neat fabric covered pelmets. The kitchen comes with a Camec 3+1 (gas/electric) cooktop and grill with rangehood and, rearward, a microwave above a large pot drawer and 90L AES three-way fridge. Further forward is a stainless steel sink and useful set of drawers and storage cupboard. Like all smaller vans and pop-tops, bench space is limited, so the laminated slide-out board under the sink is a nifty idea for extra room to aid food preparation. 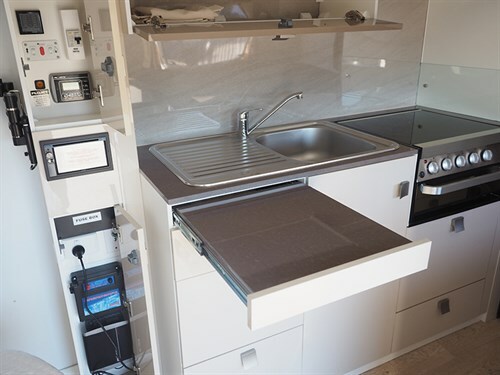 Two narrow cupboards adjacent to the sink, house all the electrical monitoring devices in one place so that water tank levels, battery condition, charging display, the Breaksafe monitor and all fuses can be easily and quickly checked. A 22in TV sits on a wall mounted bracket and is wired to a Winegard aerial in the roof. Entry to the ensuite is through a concertina door, which has vinyl walls up high that need to be zippered into place when raising the roof. As you walk in, you find a Dometic plastic toilet to the left and a shower to the right. The vanity has a mirror, good lighting and plastic sink, and every available space in the bathroom is dedicated to cupboards and shelves without restricting movement. A window over the toilet and an extractor fan provide good ventilation and hot water is fed from two 60L water tanks and operates on both 240V and gas. The queen bed is surrounded by hanging cupboards and side tables and has on opening window at the head and high windows each side. Drawers at the foot of the bed are handy for accessing stored items without lifting the mattress. The well-proven dirt road suspension means the Seka can be towed into some of the more remote locations and twin 150W roof-mounted solar panels charging the 100Ah battery lets you stay off the grid in comfort. A lot of couples will love this compact pop-top for the stylish looks, ease of towing and its full range of creature comforts. As tested, the 552 version is $56,790 on-road, through Harbour City Caravans. With a Tare of 1753kg and an ATM of 2050kg, the Seka suits a lot of mid-range tow vehicles, and its single-axle configuration makes it easy to maneuver along narrow bush tracks and into tight spaces.